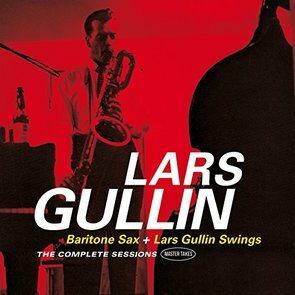 Lars Gullin was born and worked in Sweden cut off from the mainstream of jazz in the United States but having access to recordings and visiting American musicians, in many ways this was bonus as he able develop his own unique style and sound. His tone was much lighter than his contemporaries Gerry Mulligan and Serge Challof but unfortunately like them both he developed a narcotics habit which led to his early demise at the early age of 48. The recordings on these two albums cover a period of less than one year from April 1956 to January 1957 and feature a number of varying size groups, they are taken from two complete LPs “Baritone Sax” and “Lars Gullin Swings” plus a number of alternate versions and unreleased tracks from the same sessions. The first four tracks on CD One feature a sextet on three tracks plus a septet on one track and includes in the personnel altoist Arne Domnerus who is a regular partner with Gullin, his playing style owes much to Lee Konitz. Three of the compositions are by Gullin and some if his numbers have a folksy quality none more so than “Ma” which has some fine clarinet playing by Arne Domnerus and soulful baritone solo by Gullin. There are four tracks with Gullin and a piano trio playing standards and he is at his fluent best on ”All Of Me”, pianist Rune Ofwerman has that choppy style renascent of John Williams who recorded with Stan Getz. Four other tracks are by a large group which again feature standard material and the best of these is cracking swinging arrangement of “Lover Come Back To Me” which has some brilliant baritone playing by Gullin plus some hard swinging by the brass section. The final two tracks on CD One are by a quintet which includes the amazing trombonist Ake Persson who was such an asset to the Clarke / Boland Big Band and he doesn’t disappoint on this recording. The first four tracks on CD Two is the same quintet but turns into a sextet with the inclusion of Arne Domnerus on alto. These tracks are possibly the most productive on the whole set with all the horns taking brilliant solos on all tracks The ballad medley is given over to the three horns with Arne Dmnerus laying down some passionate alto on “Just Friends, Ake Persson demonstrates he is on a par with the best of the American trombone players with a nimble “Someone To Watch Over Me“ and Lars Gullin treating his baritone much like a tenor on “Lover Man“. The following five tracks are alternate versions of tunes already featured on CD One but have slightly differing personnel and you therefore get a different take on the number. Of the five final tracks the quintet session with a front line of Lars Gullin and Ake Persson is probably the best, “Ain’t No Use” is an easy paced romp with both musicians at their best and pianist Claes-Goran Fagerstedt produces a telling solo. This must be some of the best jazz to come out of Sweden and is highly recommended.